How long should it take me to complete a lesson? On average, CIE students complete 2-3 lessons a week. This is an average, though, and completion times for different lessons vary quite a bit. The introductory lessons at the beginning of most of our courses do not take much time to complete. But the advanced lessons near the end of each course may take a little longer. Accordingly, we expect students to need more time to complete them than they do for the introductory lessons. A. You can enroll in Course 1B first. It is a lab course and is designed to teach you theory and to give you the skills required of an electronics technician. Upon completion of 1B you can then re-enroll into any of CIE's other lab courses and receive 100% credit for all the work you did in Course 1B. B. 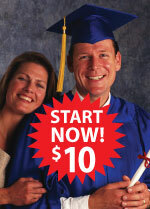 If you are sure you want to get a diploma from a more advanced course, you can enroll in that course from the start. You can enroll in 11 or 14B without taking course 1B first. This is a faster route to the advanced diploma. What if I need a course extension? Course prices and terms of payment are listed on the Enrollment Agreement. What will CIE's courses give me? Most employers are looking for someone they can train on their equipment. They expect you to know the principles and have the skills of a technician when they hire you. That's what CIE courses are intended to give you. Transfer credit from CIE to another educational institution is entirely at the discretion of the other institution, and CIE does not guarantee complete transfer or credit. The equipment that comes with all CIE lab courses is of good quality and is sufficient for the work done in the experiments. For students who prefer instruments with upgraded specifications, these are available through CIE's bookstore. Are there prerequisites for CIE's courses? If you intend to enroll in Course 2, 4, 5 or 6, we recommend that you have some previous training in electronics. If you do not have any previous training, or if you do not possess troubleshooting skills (such as using test equipment, soldering or reading schematic diagrams) we recommend, but do not require, that you first take course 1B. After graduating from 1B, you can then enroll in one of these more advanced courses at a substantial discount. This will ensure that you have the most complete training required for jobs in these areas.